I can’t remember when I heard about the Festival au Desert, which has been taking place in Northern Mali since 2001, for the first time. I do remember it was in 2009 I was offered press credentials to cover the Festival, and regretting having to turn the opportunity down. Without a sponsoring media organization to cover my costs of travelling there was no way I could finance the trip. Maybe that’s why, even though I’ve never been, I feel a connection to this event like no other musical event staged anywhere in the world and regret missing it each year more than I’ve regretted missing anything else. 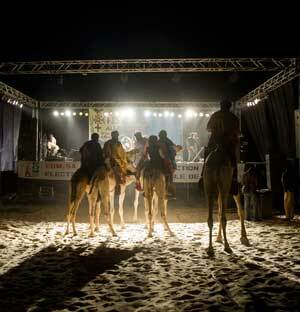 For those who don’t know, Festival au Desert is an annual celebration of the music and culture of the people of Mali. Held during the time of a traditional festival of the area’s nomadic Kel Tamasheq people, it also commemorates a peace treaty signed between the Tamasheq and the Malian government in 1996 ending years of armed struggle. All of which made the festival’s cancellation due to armed conflict in 2013 even more of a bitter pill to swallow. While it looks as if conditions have settled down sufficiently for the festival to be renewed in 2014, for a time it looked like not only the future of the festival was in doubt, but music in Mali period. What had started as a Tamasheq uprising in North Mali had been usurped by fundamentalist Islamists intent upon imposing their version of Muslim law on the region and the country, including the outlawing of music. Thankfully a combination of French, Chadian and Malian troops have ousted the terrorists forces from Mali. The French then followed this up by brokering a new treaty between the Malian government and the Kel Tamasheq. Unfortunately terrorists are still active in the region, witness the murder of two French journalists recently, which makes holding a festival with international guests and visitors something of a risk. So it might be a while before the festival can return to its home in the north. However, for those like me who can’t get there, and those who would like to have a taste of the experience, all is not lost. 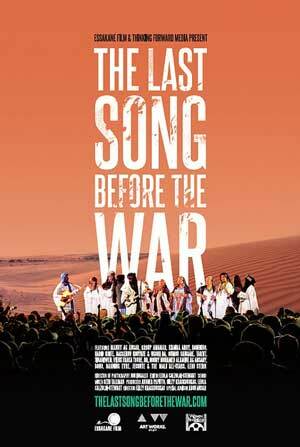 A new documentary film, The Last Song Before The War, fromThinking Forward Media, is the next best thing to actually attending the festival. Technically speaking they shot the film at the festival in 2011, so it wasn’t the last festival before the war, but it was the last one before the spectre of war hung over the proceedings like a dark cloud. As the movie details three British citizens had been killed in Mali in late 2011 and the war actually started only days after the festival ended in early January of 2012. There’s a very poignant interview with Malian singer Kharia Arbry, a woman who defied traditions to become the first female to perform publicly as a singer in Northern Mali, talking about playing with fear in her heart during the festival in 2012. However, the bulk of the movie is spent on celebrating the festival and the music and culture of Mali. We start in the capital city of Mali, Bamako, joining organizers for the final meeting before the festival as they iron out last minute details. We then learn something of the logistical problems involved with organizing a music festival in the Sahara desert. As with many developing nations infrastructure, like paved roads and bridges, we take for granted in the West, aren’t prevalent in Mali. While it might be a short plane hop from Bamako to Timbuktu, the major city nearest the festival location, it can take two to three days to cover the same distance by car. We travel north with the film crew over hard packed dirt roads and a ferry crossing through villages and small cities until we finally reach Timbuktu. Everywhere you travel are the signs of a country trying to shake off the chains of poverty. An ex Minister of tourism in the Malian government explains tourism is the third largest sector of the Malian economy. International events like the festival are vital to not just the north, but the entire country, for the spin off effects it has on the economy. We see signs of this the closer we come to Timbuktu as more and more European faces start to appear in the market squares of the towns and a local man tells us the markets are busy today because of all the tourists heading to the festival. Finally arriving at the festival site, we are struck again by its isolation. While rows of tents have been set up to accommodate travellers and there are other signs indicating something will be happening here, what you notice most is the sand stretching endlessly in all directions. As if to emphasis the point we hear from Festival director, Manny Ag Ansar, the truck carrying the sound system broke down. A replacement truck had to be found and the equipment transferred onto the new vehicle before it continue its journey north. The truck has still not arrived, but is expected soon, after which it will take about six hours for the set up. He hopes to be able to start the festival on time later that day…but… he shrugs and smiles. Then the music starts, and you realize why people like Robert Plant and Bono have made the pilgrimage to Northern Mali to attend the festival. Mali is the birthplace of what we know as pop music and to hear what are familiar sounding blues riffs played on an instrument that looks like its made out of a stick stuck into a long narrow gourd strung with four strings (a ngoni) is to understand and appreciate the music all over again. Then when you hear how the Malians, from Kel Tamasheq bands like Tinariwen to the phenomenal guitar player Vieux Farka Toure, have taken guitars, Western blues and rock and roll and melded it back into their own traditions, it’s like the music has come home to where it belongs. While scenes of crowds massed together in front of a stage listening to performances are common, watching massed rows of camel riding turbaned people parading through the grounds is not something you’ll see at most gigs these days. It reminds you forcibly you’re in another world, another culture, and you’re being given the opportunity to experience something rare and beautiful. In a continent which has seen tribal wars escalate into horrible massacres, this coming together of the many tribes and people of Mali, and of different races from around the world, for the sole purpose of enjoying each other’s music, is wonderful. The Last Song Before The War is not only a chance to experience the festival. For, while the film makers have done a wonderful job in letting the beauty and wonder of the spectacle speak for itself, they’ve also done an equally excellent job of placing the festival in its appropriate context historically and culturally. Through interviews with musicians representative of the various people of Mali and overseas, journalists, organizers of the event and audience members they inform us of the history of the event, what it means to locals (musicians and non-musicians alike) and the impact it has on those who visit. They’ve also made the wise decision to let the events of early 2012 speak for themselves. by using feeds reporting on the war’s early stages and the later developments which saw the imposition of the invaders’ narrow interpretation of Islamic law. One thing they failed to mention which is important for viewers to understand, is over 80% of Malians call themselves Muslim. However, that didn’t prevent more than 300,000 people fleeing from the draconian laws being forced on them. From internationally known musicians to poor farmers, they were all forced to flee the cities of the north to seek refuge where they could. The Last Song Before The War is a beautiful trip to an oasis of harmony and music in a world filled with strife. Far too many documentary movies never give you the chance to experience their subject matter in a tangible enough way to genuinely appreciate what the movie is about. Here the film makers have created the perfect mix of information and example to allow you to understand why music lovers the world over point to Festival au Desert as an example of what music could and should be. At the very least it should whet your appetite to find out more about the music and the people of Mali. Who knows, it might even encourage you to make the pilgrimage to the roots of the music you love.